In the experimental analysis of metaheuristic methods, two issues are still not sufficiently treated. Firstly, the performance of algorithms depends on their parametrizations—and of the parametrizations of the problem instances. However, these dependencies can be seen as means for understanding an algorithm’s behavior. Secondly, the nondeterminism of evolutionary and other metaheuristic methods renders result distributions, not numbers. Based on the experience of several tutorials on the matter, we provide a comprehensive, effective, and very efficient methodology for the design and experimental analysis of metaheuristics such as evolutionary algorithms. We rely on modern statistical techniques for tuning and understanding algorithms from an experimental perspective. 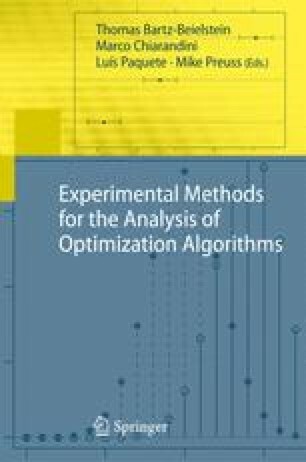 Therefore, we make use of the sequential parameter optimization (SPO) method that has been successfully applied as a tuning procedure to numerous heuristics for practical and theoretical optimization problems. Champion R (2009) What is this thing called falsificationism. http://www.the-rathouse.com/shortreviews/ WhatisThisThingCalledScience.html. Cited 18 March 2009.